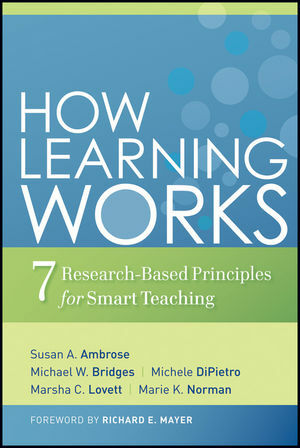 Ambrose, S. A., Bridges, M. W., DiPietro, M., Lovett, M. C. & Norman, M. K. (2010). How learning works: Seven research-based principles for smart teaching. San Francisco: Jossey-Bass. This book is an excellent resource for all instructors, but I would recommend it especially to those without a formal pedagogy background. It divides learning into seven principles based on a wealth of research in teaching, learning, psychology and cognition. The book addresses the impact on learning of many factors: prior knowledge, motivation, knowledge organization, mastery development, feedback and practice, student development (intellectual and social), course climate and self-directed learning. Each chapter provides case studies, an overview of the principle and suggested approaches based on research. The appendix section contains valuable resources and examples of tools recommended in these approaches. It is a great collection of information that feels well rounded and a good initial resource. It has an extensive reference list to support the arguments presented throughout. Personally, I appreciated this book as it highlights issues that are easily overlooked by many instructors, even when we go in to teach with the best of intentions and put in effort to help students learn. The way that students organize knowledge, and the way experts address problems and come to solutions were an eye-opener for course organization/ planning and skill development goals. At times, all the course aspects that impact learning seemed overwhelming for this instructor. My personal learning style will determine me to create a checklist to make sure I address all these issues in my course designs.